How do you describe your work, Beverly? Experimental, free-form, full of color, movement and texture. I tire easily of rigid forms and patterns. I live within the creative process – am driven by the designs, ideas and possibilities that fill my head and thrive on the fact that they are always changing and evolving. Once my pieces are nearly completed and I see how they are going to look, I start to loose interest and am ready to move to the next idea. I have to force myself to finish. And I can’t stand reproducing. I almost always start with a color combination I want to play with and sometimes I sketch ideas in my notebook. But after that, I let go and see where my beads take me. I believe that the creative process is about finding a synergy between my left and right brain. 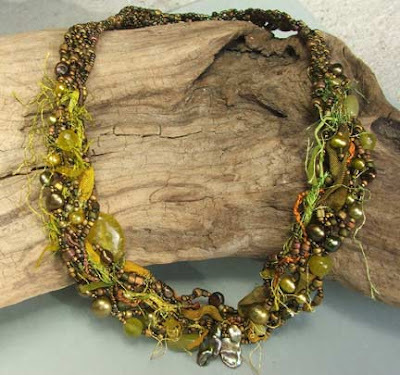 There is a constant struggle with my right brain just wanting to play with color and texture and my left brain always critiquing me – telling me how something should look, where I should place that exact bead, worried that others won’t like what I’m creating. The key is to keep going. I always get to a point where I don’t like my work. This is usually when I have just let my right brain take over and I happily bead without any idea of where I’m going. The result at this point is raw, awkward. I walk away and when I come back I realize that the bones are there – the colors, textures and general form. Now I let my left brain have a voice. Maybe I have to adjust something, flip it over or wrap it back onto itself. All of a sudden the form takes shape and I can fly with it! I am driven by color, how different colors play against each other, how a single color can be given depth by including shadows and highlights. I love making bead soups – the beader’s equivalent of a palette of paint. My designs and my preference for free-form beadweaving is all about playing with color. 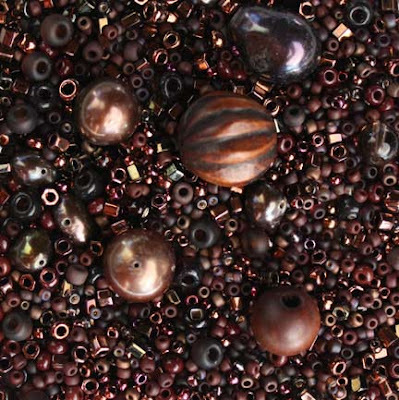 Beads on Metal was conceived because I love working with copper and wanted to pull more color into my metalwork. So many people get overwhelmed with color choices. How do you pull color together? 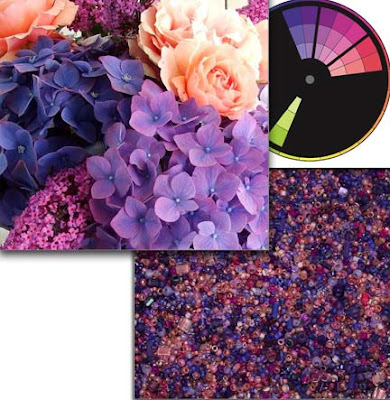 Color inspiration comes from all around me – nature, magazine pages, other art-work, fabrics, scarves, flowers. I have a wall with photos and bits of colorful things that are inspiring. Sometimes there is a specific color I want to work with and need to find other colors that will look good with it. Still other times I am working on a project with nice colors, but it looks flat and I need to find something to give it life. I think the best tool for working with color is the color wheel. There are lots of wheels on the market, most fabulous for painters who are interested in color mixing (red + yellow = orange). Because I teach classes on color and beadweaving I designed a color wheel system (EYE FOR COLOR) that focuses on color combinations – what colors look good with each other. Once I know what colors I am going to use, I create mixes that include dark shadows and bright highlights of each of the colors. I also make sure to pull the colors together by transitioning with color, value and saturation. 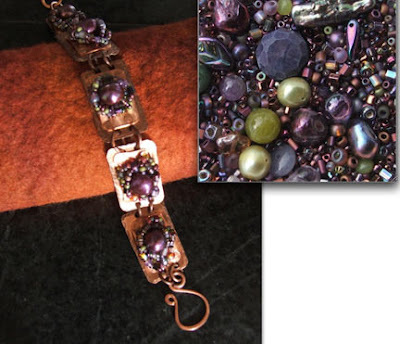 Here is a sample of how I go from inspiration, to defining the colors, to the bead soup. I was never formally trained in art (my background is very left brain – engineering), but I have always appreciated and paid attention to art. I know what looks good to me and I know what I don’t like and with time, I’ve gotten to the place where I can figure out WHY I like, or don’t like something – big step! For beadweaving: Zapper to cut off thread right where you want it. For color: The Color Wheel! My advice is to listen to your right brain a little more – let it pull you into directions that are a little uncomfortable, maybe a little odd. Think like a child and just play with your medium. Nobody else needs to see your creative process and remember that your worst critic is you! And when you get to a stopping place or get stuck, step back, walk away, be okay with your work in the raw, unfinished, awkward stage. Realize that when you are being creative it is normal and good to get to a point where you don’t like your work. It happens to me every time! After a break you can come back and see it with new eyes. Now your left brain can critique without defeating you and it is where you go from here that makes the difference. Persevere! My kids! Getting them up and going, practicing instruments, brushing teeth, driving to soccer practices and games, making sure homework is done – then repeating all of the above! I do a lot of work in their school – I teach art in 5 classrooms each week and participate in all of the fundraisers, PTA stuff etc. like all moms out there! And our house… my husband’s dream was to build his own home, by himself (exclusively). So after, 13 years (who’s counting) we have a house with sub floors and sheet rock, no furniture, no doors. But at least we don’t have to go outside to go to the bathroom… anymore. 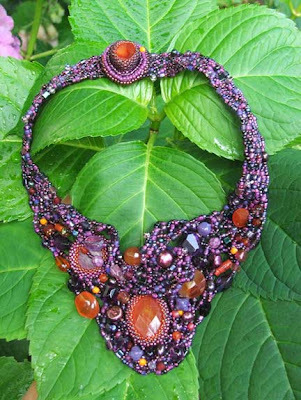 Bio: Beverly is a bead artist living in the Pacific NW. 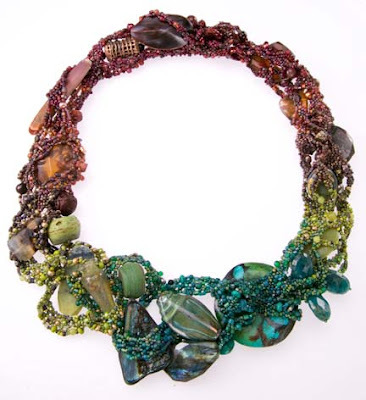 Her work features the use of color and free-form style and a number of her pieces have been accepted in national competitions: Absolutely Beads and Bead Dreams. 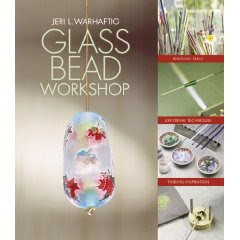 She teaches beadweaving, wireworking and metalworking workshops in shows and venues across the US and internationally. In 2008, she self-published a color wheel system: EYE FOR COLOR: Interchangeable Templates & Color Wheel System and is working on a book with North Light Books: Beaded Colorways: Freeform Beadweaving Projects and Palettes due in stores January 2010.